The betting software provided by BF Bot Manager places tips for you. TippingSports.com provides tips from a variety of quality tipsters. On this page I explain how to get the tips placed for you. 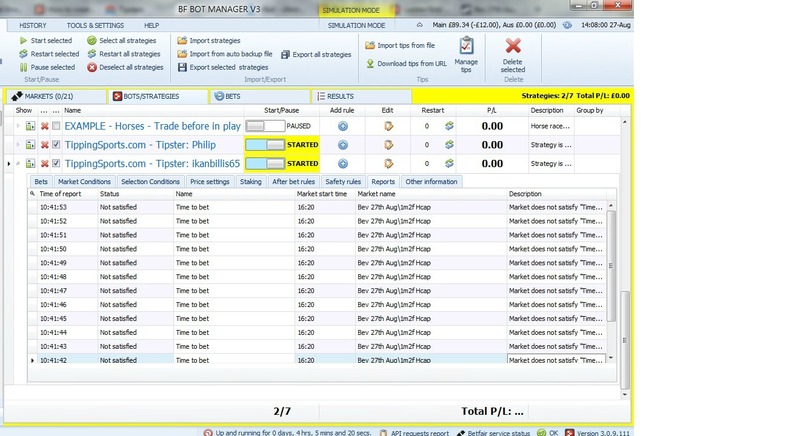 To start you need to set up Strategies on the BF Bot Manager v3 betting software. This will place the tips for you from Tipsters you follow on TippingSports. Once you get to know your way around it is a simple process. There is a video https://www.youtube.com/watch?v=1qy9cr7W-9k which shows you how to do this. I will walk you through this now. Once the video loads adjust the settings to slow it down. - the lowest speed will give you time to take in what is going on. Even at this speed you will need to play it through several times. You will need the betting software from BF Bot Manager v3 up and running and set to Simulation Mode. You will also need to open the TippingSports website. 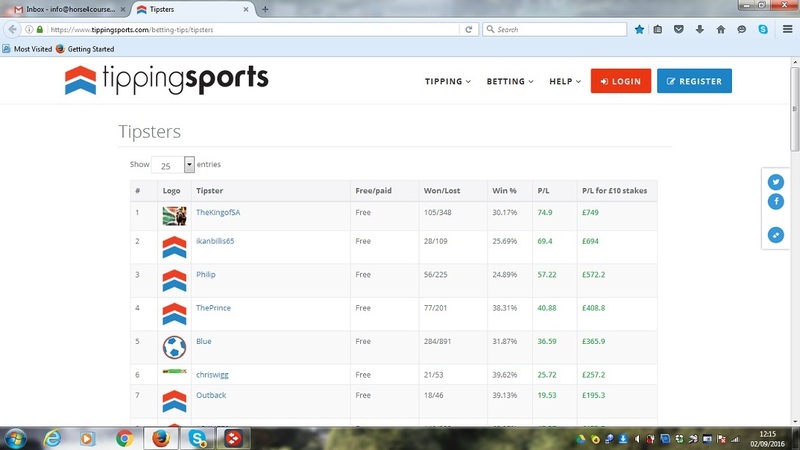 The first frame of the video is a list of the TippingSports tipsters in order of profitability. You will have studied these to decide which, if any you wish to follow. Click on the name of the tipster to bring up their details. Click the follow button. Below this click the blue button that says ‘Download the strategy file’ . A pop up box appears to allow you to save the file to your computer. In Bot Manager click the Strategies Tab and the ‘Import strategies’ at the top of page. This opens a window showing the download you saved to your computer. You may have to search for this if it is not immediately visible. Return to the TippingSports site. At the top right of the page click My Account then My Profile from the drop down menu. On the left of the page is a ‘Unique link for importing tips to betting bot'. Copy this link and return to Bot Manager. NB You will only need to copy this link for the first Strategy you set up. If you add further Strategies omit importing this link. Click ‘Manage tips’ at the top on the right and a Tip form pops up. Click the ‘Tips autoloading tab’ and in the field below URL paste in the unique link you have copied. Click the field below Active and a tick appears to show the Strategy is active. Click the field below ‘Reload from URL’ and the drop down menu displays a box with days hours mins secs. Change the mins to 8 which means the tips will upload within 8 minutes of posting. The video shows 30 mins but 8 mins this will ensure you do not miss tips. The tipster may post as late as 15 mins before the start of the event. Finally click the ‘Save’ button and then ok to the pop up window. Click ok to the pop up window. Back at the main page at the far left of your Strategy to the left of the red cross is a tab to show/hide the Strategy settings. Click on ‘staking’ and in the field level/initial stake Click the edit icon and change the level stake as required. NB Tipster’s post any bets from 0.25 to 2 points of your level stake and these points will place on your bets. If your level stake is £10 then your bet placed by the bot can be £20 if the tipster advises a 2 point bet. So check what the tipster usually advises and how many bets per day before you set your level stake. All that remains is to change the Strategy ‘start/pause’ button from pause to start. The advice is that you start the betting software on Simulation mode for a day or two. This enables you to check everything is working how you want. The button to do this is at the top of the page.